The Christian festival of Easter is about the crucifixion and death of Jesus, followed by resurrection. In this post, I am looking at depiction of the Easter in the art and sculpture from different parts of the world. Most of the examples of art and sculpture about Easter that I could find in my image-archives are about the crucifixion and death of Jesus expressing his suffering and the grief of his family and followers. Art and sculpture about resurrection are much less common. Probably it is because pain, death, sorrow and grief are stronger and deeper emotions compared to the joy and happiness, and thus are preferred as themes for art and sculpture. First take a look at three sculptures of crucifixion. All the three sculptures are in wood and are from the Metropolitan Art Collection of Bologna (Italy). The sculptors of these statues are not known. All the three are from medieval period and from churches around Bologna. The first sculpture has an older and patrician looking Jesus, his face is serene and his body is well-filled out. The second sculpture has an older looking and emaciated Jesus. His face is lined with pain, his ribs are visible and the way his hands are placed, it underlines his suffering. The third sculpture has a younger and pale looking Jesus with a wisp of beard. Though his face looks serene, the thick rope like red blood falling down from his body is reminds me of the violence shown in Tarrantino films. Thus, though all the three sculptors depicted the same theme, the personal sensibility of each of them influenced the way it was done. The three sculptures evoke slightly different emotions. After the death of Jesus, his body was brought down from the cross. His mother Mary and his friends and followers including Mary Magdalene surrounded his body, stricken with grief. They prepared his body for burial. This scene has been imagined and depicted by sculptors and artists numerous times. The first is a detail from a 1335 altar-piece painted in Jacopino-style from the National Gallery of Art in Bologna. It has the crying Mary dressed in black like a nun, holding the body of her son with blood on his forehead, a reminder of the crown of spines that was put there. The second is a 1462 altar-piece by Michele di Matteo from the National Gallery of Art in Bologna. In it, Mary holding the dead body of Jesus is in the centre. A black shawl with a blue border covers Mary's head and body while her dress is blood red. Both Mary and Jesus are shown as old. The third is a 1506 painting by Lorenzo Costa from the National Gallery of Art in Bologna. It has two men who are preparing the body of Jesus for the burial. A young looking Mary, her face more serene here, seems to be telling them to be more careful. The next is a group of early 16th century terracotta statues by Alfonso Lombardi at the St Peter's church in Bologna. The sculpture is called "Compianto" and shows mother Mary and other persons standing around and looking with sorrow at the dead body of Jesus. The last image in this group is another "Compianto". This one is from Santa Maria della Vita church in Bologna. 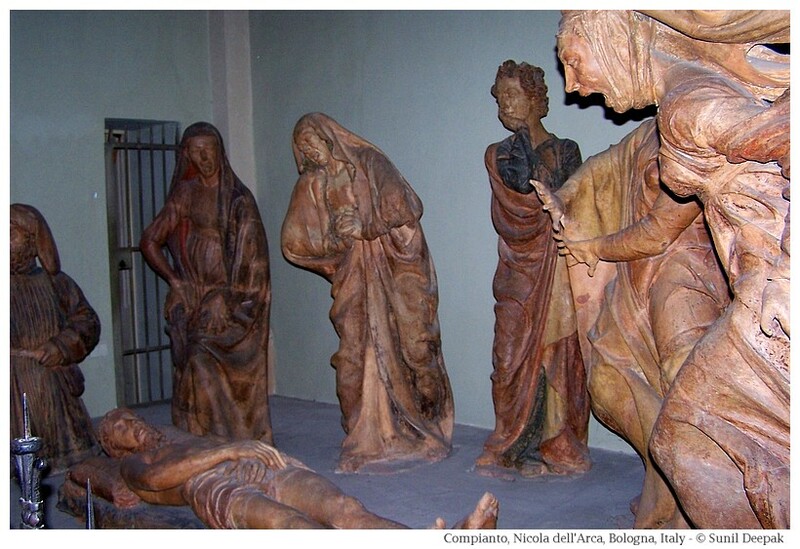 This group of seven terracotta figures is from 15th century and is the opera of sculptor Niccola dell'Arca. This is one of my favourite sculptures. In this work the women, especially mother Mary and Mary Magdalene, are showing their grief openly, both seem to be screaming. 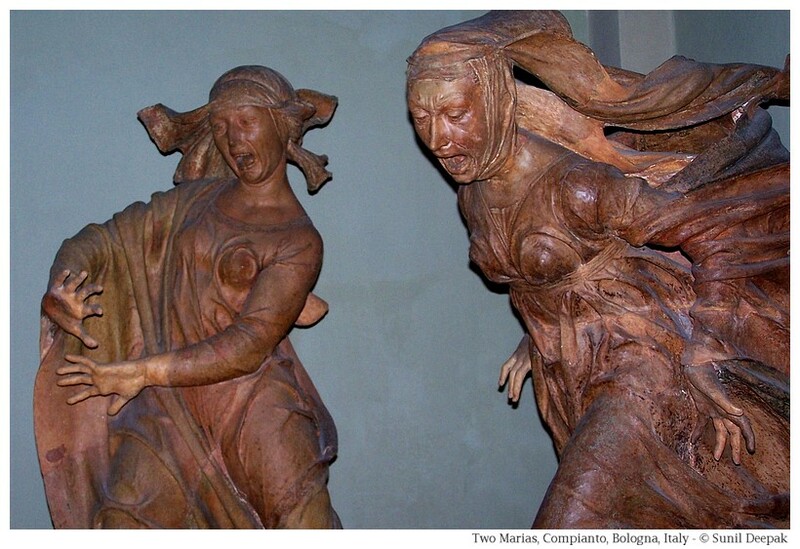 Among the local persons in Bologna the two figures are known as the "Ugly Marias of Bologna". I like this sculpture because it is rooted in more human emotions. The most famous depictions of the death of Jesus is in the marble sculpture "Pieta" by Michelangelo. Sculpted in 1499 for the funeral monument of a cardinal, it is now housed in the St Peter's Cathedral in the Vatican. The sculpture has a very young and beautiful looking Mary holding the body of Jesus in her arms. In the triangular shaped sculpture, with the tip of the triangle at Mary's head, the body sizes are not very proportionate. The marks of the crucifixion-nails on the body of Jesus are small and easy to miss. "Pieta" was taken to New York World Fair in 1964. It was severely damaged by a mentally disturbed person in 1972. Though I had seen it from close in 1982, at that time I had not taken any pictures of the statue. Some years ago it was placed behind a bullet-proof glass and is difficult to photograph now. However, there are different copies of Pieta in different countries - below I am presenting some of those. The first is a small replica of Pieta from a tomb in Verrano cemetery of Rome. The second is an exact official replica of Pieta from the Cathedral of Brazilia in Brazil. Made for the visit of Pope John Paul II in Brazil in 1989, like the original it is made in marble. It is 1.74 metres high and weighs around 600 kg. The third is 8.8 metres high giant replica of Pieta from the Cathedral of Kohima in Nagaland in the north-east of India. The last is another replica of Pieta from a church in Munnar district in Kerala in south India. This picture was taken from a moving bus. Easter and the resurrection of Jesus are usually represented in symbolic way through the Easter eggs, Easter bunny and Easter doves. Compared to the crucifixion and death of Jesus, art and sculptures about his resurrection are not less frequent. The next image is of a 1450 painting by Antonio Vivarini from the National Gallery of Art in Bologna. It shows a pale looking Jesus with blond hair, standing up in the coffin, showing the marks of the crucifixion nails on his body. Behind him the blue skies with white clouds and the greenery on the hills suggest the joy of the nature at his resurrection even if the overall mood of the painting is somber. To conclude this collection of images of art and sculptures related to Easter, the last image of this post is from the Holy Sepulcher church in Jerusalem. This church is made at the place where Jesus was crucified (Galgotha) and later, buried. The image shows the "stone of anointing", where the body of Jesus was laid out and prepared for the burial (also shown in the image on the wall behind the stone). For the examples of art and sculpture from Italy, most of the images are from Bologna (Italy), where I have lived for many decades.